With the summer holidays approaching I have been thinking about what I did during that long break when I was young. Like most of us I seem to remember that most summers were hot and sunny, just like this year (although I can also picture playing Monopoly with my parents in a caravan in Wales, the rain pouring down the windows outside). While I do remember getting out and about I also have memories of looking forward to the summer television schedules. They were a much more modest affair than today, with maybe a couple of hours extra programming each morning. Two highlights that come to mind from this were Laurel and Hardy, and the Banana Splits; both of which had slapstick at their heart. 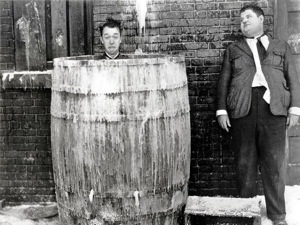 I have retained a love for Laurel and Hardy in particular, since it not only reminds me of that time, but also of my Father howling with laughter at them. As I have got older I have come to appreciate that they are not only funny but very skilled and clever too, how else could they be so entertaining nearly a century after they first released their films. 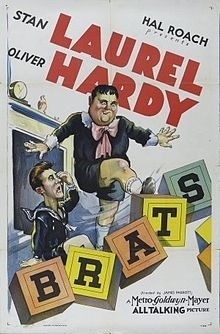 What I had not realised until very recently was how much of their act must have been based on watching how children interact, something they all but admitted with the 1930 short film Brats. There seems to me to be an older/ younger brother relationship at the heart of what they do which is at the same time frustrating, funny, violent, joyful and endearing; so pretty much like watching Jake and Sam on an average day. 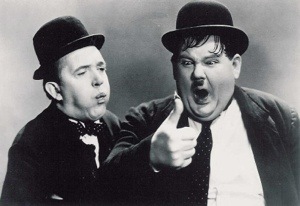 I have recently introduced Stan and Ollie to the boys, they spotted my 21 disc box set the other day and wanted to know what it was, and while Sam is still a bit too young (he calls it “funny box”), Jake is loving the slapstick comedy and how “silly” they are. They also find it funny when I tell them that they are just like that, although I’m not sure that they believe me. Think of the boys being like Laurel and Hardy somehow make me more sanguine about how they are with each other because beneath the cross words, the pushing, and the fighting over the only toy that they could both possibly want; lies an affection and a need on some level to get along, which seems to get stronger as they get older. It also means that I can find something funny that I may have before thought was a petty irritant. It also reminds me that children are more like adults than we care to admit, it’s just that they do not have the social awareness and skills to work things out through negotiation. This makes me wonder just how much I should intervene when the boys are going at each other? Should I let them work it out for themselves? Or should I jump in straight away? I try to leave them as long as I can but, sooner or later, I am worried that if I do not come between them I really will be left with another fine mess. Categories: Culture, My boys, My Father | Tags: Laurel and Hardy, my boys, parenthood | Permalink. I’ve been away this week, hence the absence of blog posts (no internet connection – I know how did I cope?). I’ve been with the family up at my late Father’s house sorting furniture for our own house move next month (and more on this at a later date). This required that I hire a van to bring the stuff back. I love driving vans, there’s something about being higher up than most other road users that I find quite compelling: you can see more of the world around you, and you get a better view of the traffic. This was not the case on the way there, however, as I drove through a huge thunderstorm coming over the Pennine Hills, but I was certainly glad to have the van as most car drivers had to stop, so fierce was the weather. The journey back was a much more sedate affair and I really enjoyed driving along with Jake in the cab beside me. He was very excited to be there and on the way we had a few chats about a drawing of a pirate ship that I’d done for him earlier in the day (I needed to add a plank), and about what he was going to do when he got home (get his kite out), before he drifted off to sleep. As my mind wandered a little I began to think about the reason I enjoy these road trips so much. When I was a boy my Dad had a job as a lorry driver, delivering oil and petrol around the North West of England and North Wales. Every now and again during the school holidays he would take me out in the lorry delivering to great places such as airports, factories, hospitals and hotels. These places also seemed huge and endlessly fascinating to an eight year old, especially as I got to see the parts of them that most people didn’t get to see: the boiler rooms, loading bays, and control towers. I thought that my Dad had the best job in the world. But it was not the destinations that stayed in my mind the most, nor the great views over the hedgerows, not even the brilliant lorries that he used to drive (and I can close my eyes and still see the inside of many of the cabs). Rather it was the little adventures and encounters we had on the way, at transport cafes, with employees at the places he delivered to, and when we occasionally broke down – we once brought an entire town to a standstill. It was a glimpse into a completely different world, my Dad’s world, a grown up world, a world that seemed so alien and far away. So I completely understood why Jake was so excited to come into the van with me today, and I hope that (before he went to sleep) he has taken some memories that will stay with him for many years to come. Let’s hope that there are many more trips that he and Sam will take with us that will leave their indelible mark on them, and help them to get to know more about the world around them. Categories: My boys, My Father | Tags: boys, memor, my father, road trip | Permalink.